The finale to the Disney XD animated TV series Star Wars Rebels season 2 was dramatic, to say the least. Between Ezra (Taylor Gray) accessing a Sith holocron, Kanan (Freddie Prinze Jr.) being blinded during a battle and the long-awaited showdown between Ahsoka Tano (Ashley Eckstein) and her former Jedi Master Anakin Skywalker-turned Sith lord Darth Vader (James Earl Jones), Rebels season 2 wrapped up in such a way as to set up for season 3 to be even more exciting (and darker) than what's come before it. Speaking of Ahsoka: the Rebels season 2 finale was vague about whether or not Anakin's former apprentice managed to survive her fight with Vader. 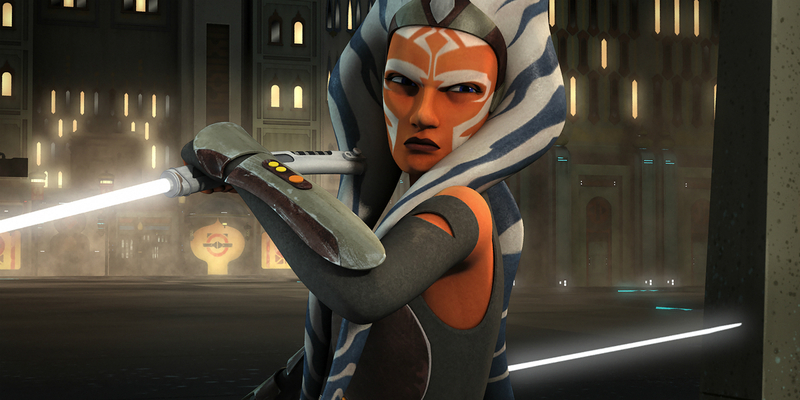 Rebels co-creator and showrunner Dave Filoni likewise played coy about the issue shortly after season 2 concluded, indicating that although there is more of Ahsoka's story to be told (specifically, in the upcoming Star Wars: Ahsoka novel), her time on Rebels is now done. Now, however, Filoni seems to be back-tracking on that matter - at the same time, cautioning that Ahsoka's potential return to Rebels may not happen the way fans expect (or would like). "The fan support behind her is a strong argument. I've always had a story in mind, so I haven't changed that story in all honesty [...] She's become very important as people realise she's got a relationship to Anakin, Darth Vader, now more than ever. There's a lot there as a character that I think is exciting to explore." While it's possible that Ahsoka will return in the flesh in Star Wars Rebels season 3, there's also a strong possibility that she will appear as a Force ghost or disembodied voice, judging by Filoni's comments on the subject. Either way, the focus of Rebels season 3 will continue to be Ezra, Kanan and the rest of the Ghost's crew. At the same time, the show is expected to continue integrating connections to the larger Star Wars universe, as it has in seasons past. That includes not only connections to the Star Wars: Clone Wars animated TV series (a la Ahsoka, Captain Rex, and so on), but possibly even more links to live-action Star Wars movies past... and possibly even some future ones too. Star Wars Rebels season 3 begins airing on Disney XD this fall.